The Overdrive SX is a Sigma-Delta DAC with selectable filtering that delivers the sound of a NOS DAC with tube output, only better. It is available with an ultra-low jitter XMOS USB or Ethernet interface, as well as coax and I2S inputs. It has an ultra-simple analog signal path, reducing background noise and harmonic distortion to unprecedented levels. It incorporates a preamp function that is superior to virtually any external preamp. The Final Drive is a pair of passive transformer buffers/selectors, one for the left channel and one for the right channel. 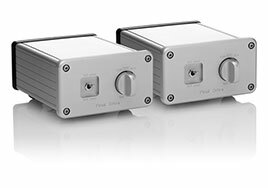 The Final Drives can be inserted between DAC and amps or between preamp and amps to isolate earth ground, add analog selections or convert from Single-Ended to Balanced or Balanced to Single-Ended. These high-quality hand-made Japanese transformers actually improve sound quality. The Synchro-Mesh provides a method to improve the sound quality of virtually any 2-channel digital audio source without needing modifications to the source device. It inserts between the source device and the DAC, SS processor or SS Receiver. Our proprietary design techniques enable the Synchro-Mesh to deliver an unprecedented 7psec of jitter at the end of a 4-foot coax cable. An additional digital cable is required. The Off-Ramp 5 USB converter provides a USB computer interface to your audio system with unprecedented sound quality. With asynchronous support up to 24/192 resolution and bit perfect playback from PCs and Macs, it is simply the best USB converter. The Interchange is an Ethernet Renderer and Network Interface that delivers unbelievable sound quality when used with the optimum playback software. Unlike USB, the computer used does not affect the sound quality. Great for playing both local tracks on a computer and for streaming services. Extremely low jitter.